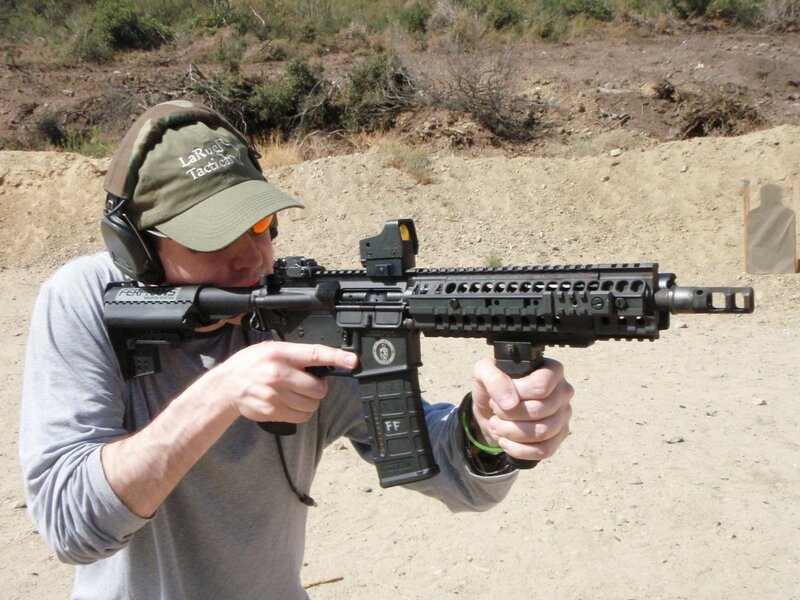 Videos: Controlled One-Handed 30-Round Full-Auto Mag Dump and Short Bursts with 5.56mm NATO Select-Fire FERFRANS SOAR-P Piston AR SBR/PDWs | DefenseReview.com (DR): An online tactical technology and military defense technology magazine with particular focus on the latest and greatest tactical firearms news (tactical gun news), tactical gear news and tactical shooting news. DefenseReview (DR) contributor Chen Lee a.k.a. “SMGLee” recently got the opportunity to run a FERFRANS SOAR (Special Operations Assault Rifle) gas piston/op-rod AR SBR (Short Barreled Rifle) out in the desert. During the test, he fired the weapon one-handed to see just how controllable FERFRANS SOAR select-fire 5.56mm NATO (5.56x45mm NATO) SBR/PDWs are. In the video below, Lee performs a one-handed 30-round full-auto mag dump, and the weapon stays right on target. FERFRANS SOAR select-fire SBRs, carbines and rifles (direct gas impingement and gas piston/op-rod) employ the patented FERFRANS Rate Reduction System which lowers the weapon’s full-auto cyclic rate of fire (ROF) below the 700 rpm threshold, to approx. 680 rpm. This lowered cyclic rate dramatically enhances full-auto controllability. Hear all those “dings”? Those are all hits on an 8-inch (8″) steel plate. In the above video, the operator/instructor keeps his weak hand on the principal/protectee while engaging the threat one-handed. Even if you’re shooting two-handed, it’s nice to have a controllable select-fire/full-auto gun. After all, if you have to hit the happy switch (selector switch) and go rock n’ roll on the threat (like an enemy ambush, for instance), you’re probably going to be moving while shooting, so you most likely will not be able to get into that perfect shooting stance to control the weapon. That’s the beauty of the FERFRANS SOAR SBRs–you can fire them on full-auto while you’re off balance and still keep all the rounds on target(s). If you’re going to use a select-fire gun, why not go with one that allows you to apply surgical full-auto fire, even one-handed? Click here if you’d like to watch some 90-round FERFRANS SOAR full-auto mag dumps. Previous: DefenseReview (DR) Attends the 2010 Gun Rights Policy Conference (GRPC) in San Francisco! : San Francisco Values Get a Serious Upgrade. Next: DR Exclusive: Colt CM901 7.62x51mm NATO (7.62mm NATO)/.308 Win. Modular Battle Carbine/Rifle Magazine Revealed in Pictures (Photos! ): Is it the MagPul PMAG 20LR 7.62mm Magazine? Read and See!